Discussion in 'Battle Reports' started by Itepixcauh, Feb 8, 2018. Well since my Salamander project is getting near of being completed I've decided to start on my second love from my Fantasy era, my totally Not-Bretonnia army which holds a very special place in my heart. I win the roll to go first and decide to take it just for the chance of landing a rock on the head of that Dragon. On the left flank I'm feeling confident as my Spearmen are facing his Knights and that is a great advantage to me so I advance to completely block the space between the tower and the forest with them. My martyrs and bowmen also advance a little. 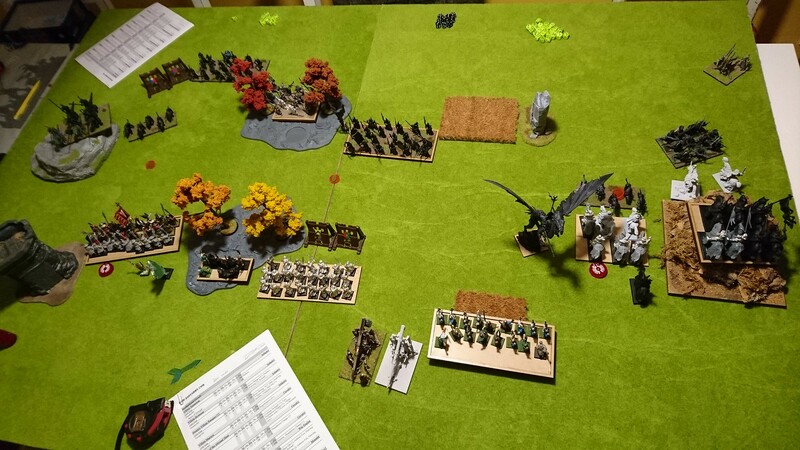 On the right that damn Dragon sticks out like a painful nail in my eye, there is not really much I can do to counter him apart from a nice bait and pray for my shooting to be efective, so I move my Abyssal-Hunt and Reconnoiterers into range of his Dragon and my other units behind them to countercharge. My Redeemer is the Ace up my sleeve here, as he can charge him where ever he lands or go to hunt that Blot Thrower if needed. Shooting fails me big time, so hits with the Siege Artillery and just a couple of wounds with the Rangers on his Gargoyles on the left. 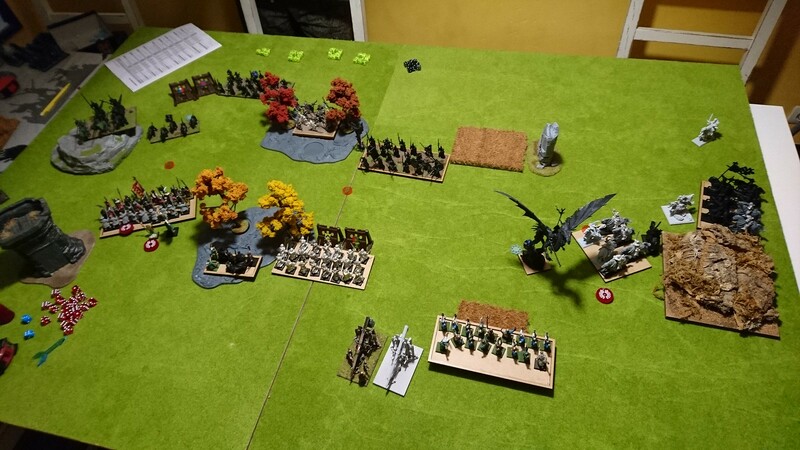 On his turn he takes the bait partially charging the Blade Dancers into the Reconnoiterers and the Gargoyles into the Abyssal-Hunt, his dragon moves to the flank of my units to bring some pain next turn. HATE THAT THING! His centre line advances towards mine and the objectives. The left units advance to face my Horde of Spears while the Crossbows shoot at them making some damage but not enough to cause real pain. His combats go as expected with the Blade Dancers turning the poor Reconnoiterers into a fine mist (and I'm glad as that means I don't have to write Reconnoiterers again!) leaving them exposed to a very nasty Combo charge next turn. The Gargoyles manage to do some damage but not near enough to do anything to the Knights. 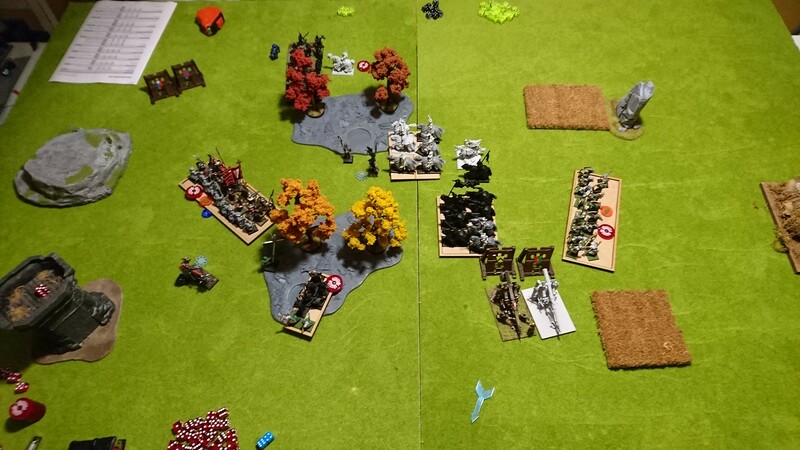 The right flank is easy right now, my AH counters the Gargoyles while the Initiates and Forsaken Beast charge the Blade Dancers and my Redeemer slams into his Bolt Thrower. If every thing goes according to plan I should be able to reform everything to face his dragon. Left flank advances too while the Devoted starts her prayers, transferring some wounds into her. Martyrs take the Obstacle in the middle and prepare to hold the centre at all costs. My shooting phase is a mixed bag, only one Siege artillery is in range of the Dragon but misses, the other shoots the Spearmen missing as well... not great so far. On the other hand! the Bowmen must have ****ed themselves with fear or something, having that huge scary dragon in front of them because boy do they perform, they manage to get 4-5 wounds on him and amazingly they WAVER IT!! That is the best news possible, that dragon is a sitting duck for my cavalry now. My Rangers manage to waver the Gargoyles on the left too, nice turn. Combats go as planned too, everything on the right flank dies except for that dragon and my units reform accordingly. He decides to go for it this turn and charges the Dark Lord and the Knights into the Spearmen and his Spearmen into my Martyrs. His Dragon decided the best solution rather than turning around and exposing the rear to my Bowmen (not really that scary but who knows! 60 attacks are a lot) he will back up 5 inches which at first I thought it was rather stupid move but then I realised he had managed to block one of the units of knights from charging him because there wasn't enough space between the Rock and the AH to fit the Initiates so they couldn't charge first and if I charged the AH first then again there isn't enough space with that rock there to fit them anyway. Amazing move from my opponent. His shooting is meaningless, some wounds are dealt to my Rangers but nothing significant. 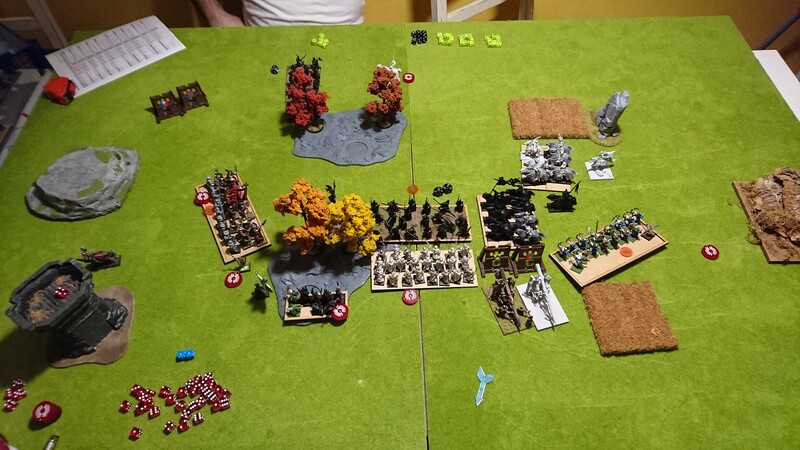 Combat phase start with the Knights and Dark Lord doing quite some wounds to the Spearmen but thanks to Phallanx and the bubble of Rallying (2) I have there it's not as bad and they hold. Same goes with my Martyrs, not even near to routing. As only one of my units can charge that Dragon I choose the one in the flank of course, so I sidestep the AH and go for it. Redeemer and Forsaken Beast start the long walk back into the fight. All my shooting on the right is out of objectives so I reposition everything. I countercharge everything I can and my Rangers back a bit to stay out of the range of his Reaper Guard and shoot them, failing miserably. Devoted keeps Devoting. Combats on the other hand work great, My Initiates obliterate the Dragon doing a lot of wounds and my Spearmen thanks to the Brew of Strength manage to put 9 or 10 huge and juicy wounds on the Knights, the Nerve test is kind to me and they rout, I choose not to reform to face the Reaper Guard that is in range as doing so would leave my Devoted vulnerable to the Dark Lord and a Hindered charge in the flank is not that bad considering they are now almost up to full health. The Martyrs keep grinding in the middle doing what they are supposed to do, keeping those Spears pointing away from my Cavalry. He spots my cunning plan to take my Redeemer into his Crossbows and turns them to shoot him. 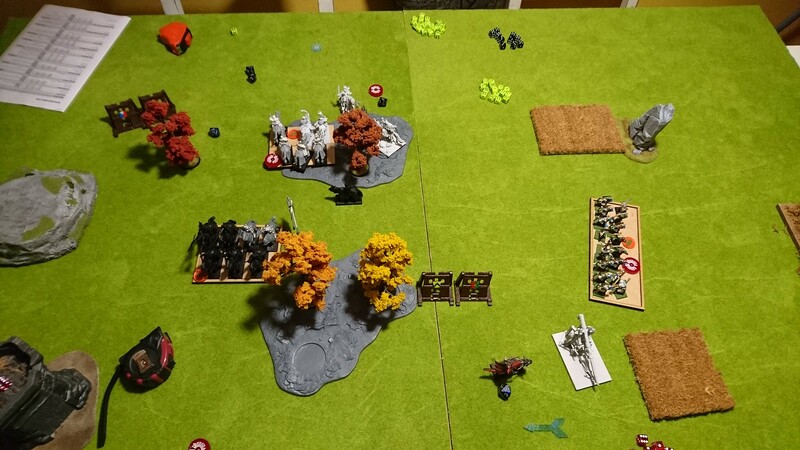 Reaper Guard takes the chance and charges the flank of my Spears with the Dark Lord on the other. His Gargoyles charge Hindered into the Rangers to shut them down and hopefully taking their Valiant/Inspiring bonuses off. He actually manages to put a couple of wounds into the Redeemer, but nothing he can't take. The Priestess BC the Spearmen to see if they can rout those pesky Martyrs and prepare themselves for the incoming wall of pain on the right. Again thanks to Rallying and the Prayer the Spearmen HOLD! Amazing performance so far. The Spearmen do great taking the Martyrs to 14 wounds or so but again with the Valiant/Inspiring bubble they hold steady, sealing the fate of the Spearmen. Gargoyles manage to wound the Rangers but their Nerve is huge and they hold too. I countercharge the Spearmen into his Reaper Guard, leaving the Devoted exposed but she has done her job already. The Martyrs and Initiates charge his Spearmen while my Redeemer runs bravely into a sea of arrows. My Rangers Countercharge the Gargoyles to show them how to fight properly. My Redeemer regenerates some wounds and is now almost into the Crossbows, just one more round of shooting to take. 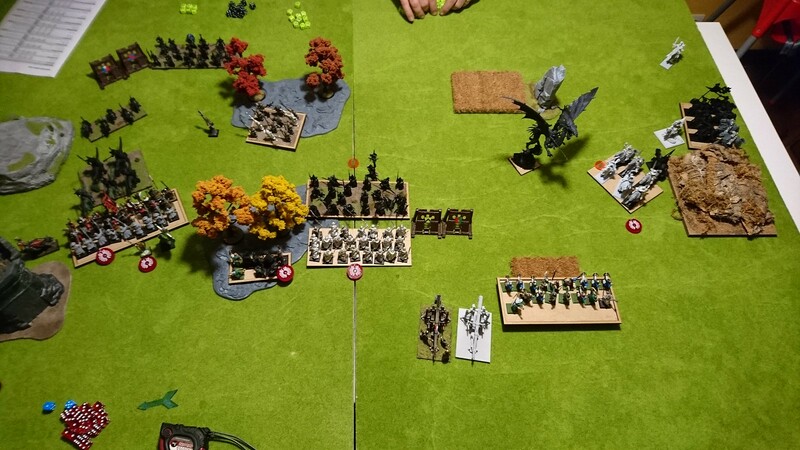 The brave Rangers do great and kill the Gargoyles with ease, the combat with the Spearmen goes into Double One figures and once again as it's often the case when you overcommit they make their appearance and the Spearmen hold. The starts though are the Spearmen, they again manage to put like 11 wounds into the Reaper Guard and rout them! What a performance! Now free to move into my Devoted and punish her for her insolence, the Dark Lord charges in (having now 11 wounds on her, it's not looking great). The Spearmen surprised to be alive decide to finish the Martyrs once and for all. The shooting phase comes and the Crossbows open fire at point blank, but the mighty Redeemer holds once again! The Priestess throws a fireball into the battered Spearmen, it's too much for them and they Waver. The Spearmen finally kill the Martyrs and happy to have finished their job they reform to accept their fate. Dark Lord kills the Devoted with ease and now has the Rangers on his sight. My brave Redeemer finally manages to reach the Horde of Crossbows. 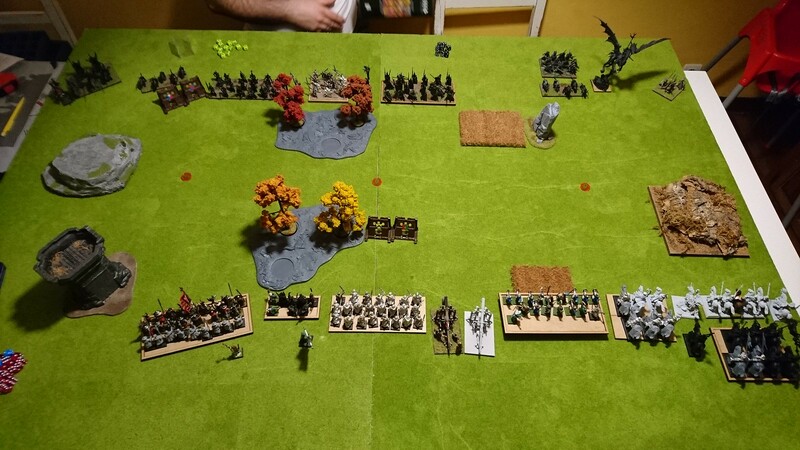 My initiates Charge the Spearmen once again and the AH are very excited because they have two Individuals neatly lined up for their entertainment. The Rangers reform to try and take down the Dark Lord that's been causing so much trouble. The Rangers one again do great and waver the Dark Lord. The Initiates don't roll a double one again and put an end to the Horde of Spears, sadly though the AH are only capable of wavering the ASB, stopping them from killing the Priestess. On his turn the only thing of importance is the damn priestess killing the brave Spearmen once and for all with another Fireball. The Crossbows try to kill be Redeemer in combat but fail again. These turns are basically clean up, nothing really interesting happens. My AH kill the ASB, Rangers fail to kill the Dark Lord that kills them in his turn, Crossbows fail again to kill the Redeemer. 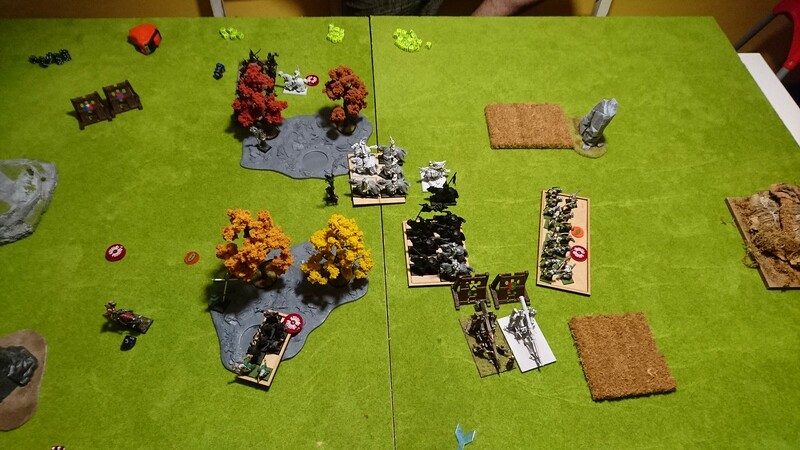 Last turn my AH slam into the flank of the crossbows and my Redeemer and Forsaken Beast (forgot about it didn't you?) charge the priestess that holds! Crossbows are not so lucky. On his turn the Dark Lord kills a Siege Artillery and the game ends. A sounding VICTORY to the Brotherhood on their first outing. 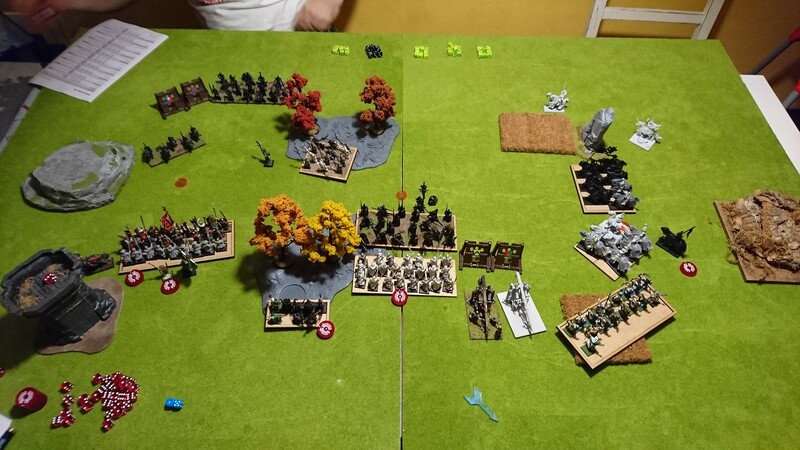 Almost tabled my oponent and on top of that the three LOOT tokens (Orange markers you can see on the field) are in possession of the Brotherhood (Horde of Bowmen, Abyssal-Hunt and Initiates). MVP: No doubt about this the Devoted with Martyr's Prayer. Thanks to her the whole left flank was held AND killed by a humble Horde of Spearmen. Fantastic! Stay tuned for more soon and thanks for reading!!! I might be being thick but who won? Warden and Itepixcauh like this. Yeah. It's not your problem, I'm afraid I was too concentrated on the Pew-pew, Slash-slash that forgot about the conclusion that I'm adding now to the original post. 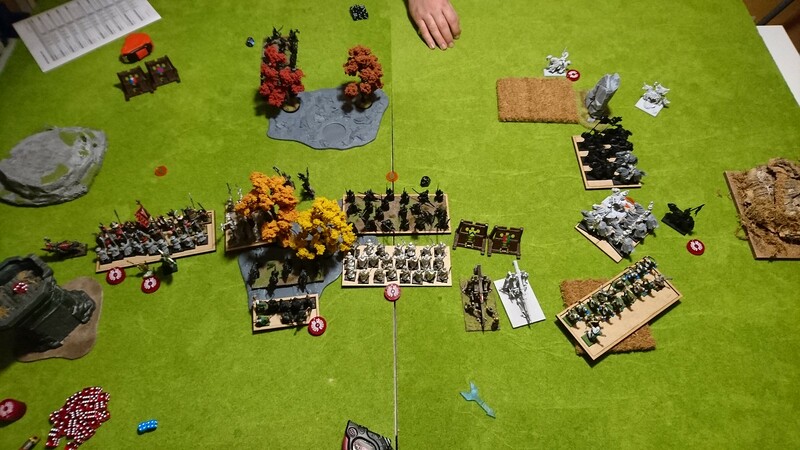 Brotherhood won controlling the three Loot tokens and almost tabling the Elves. As soon as I finish the Lizardmen they are next. Great to see that the Bretonnians rode again to a resounding victory! Considering what your Lizardmen look like, I look forward to seeing how your mighty Brotherhood of Bretonnians turns out (so would the denizens of the Round Table I am sure ). Crowsfoot and Itepixcauh like this. That is sadly true, KOW seems to be a great game. I hope to play some (someday ), I am glad the rules are free! Lord-Marcus and Itepixcauh like this. Also it has by far the best community I've ever seen in any game. I'm yet to find one single toxic player. That is a very good compliment to the game, considering (my opinion) a lot of their "early" fanbase were jilted 8th edition warhammer players who wanted to keep playing with square bases! Biggest thing I like about the rules were how streamlined the playing system seems to be. Though some of the "flavor" might have been lost, I am wondering how much time might actually be saved with the KOW rules? Do you find that your games tend to be a bit faster than in 8th? I am guessing setup at least is a bit faster using those excellent multi-bases. 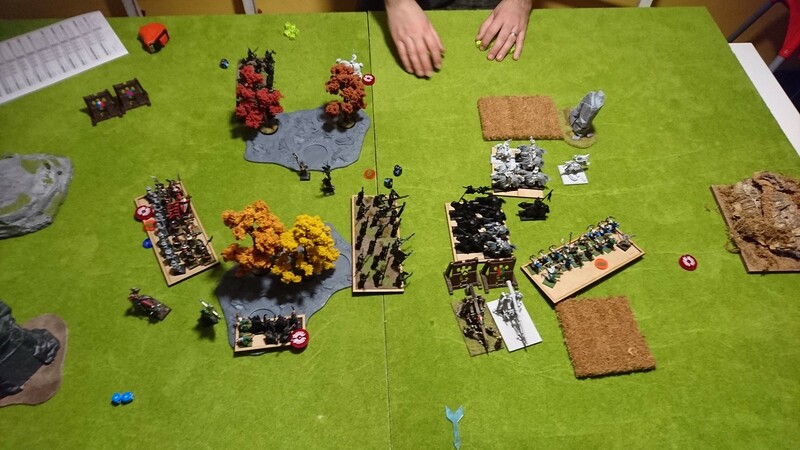 Games are extremely fast compared to WFB. Just to put it into perspective a 1000 point game will take you about an hour, 1500 about 1:30 and 2000 points 2 hours and I'm not exagerating those are the times you get in the chess clock for tournaments and timed games. And you also don't end with a headache after playing which is a plus. Best thing though is the use of chess clocks, as there is no player interference in your own turn you can, and should, always use them (game was designed for them). It's a blast! As i've said if you play the standard 2000 points you get 1 hour each, if you time out it's your own fault. I do agree that you lose some flavour but I think is a price worth paying for what you get instead. Also there is a very good reason why, despite having a lot of 8th edition renegades, it has a great community. Toxic players play games that can be exploited in some way or other. The Balance of the game is almost perfect and it is revised each year. The Rules Committee does a great job at keeping the field balanced and shutting down any exploit of the rules they might have overlooked . I'm pretty sure there are still toxic players in the community, that's a given in any competitive game, but most of them move on to other games that suit them better. I mean, you say that but I've been here. I just don't post much in the way of reports because i am mainly a painter. Of course I didn't meant to say I was the first KoW player here. I'm well aware of that is just that I'm proud of moving the community along posting content.